Breast cancer patients have enough to consider without being confused by claims of improved outcomes of their breast cancer if only they….now fast at night at least thirteen hours. In a recent study early stage breast cancer recurrences were significantly reduced if you fasted at night for at least thirteen hours, which seems to be the magical time span. I’ll bet you didn’t know that. Neither did I. No doubt, a portion of early stage breast cancer patients who have heard of this will be adjusting their dinner and breakfast schedules and getting nocturnal locks for the refrigerator. Yes, there is sound physiologic and pharmacology explanations for this mostly centering on the complicated relationship between glucose metabolism and cancer growth. I don’t want to be glib or cynical about this finding. Life style choices certainly matter, but quantifying them is a challenge. 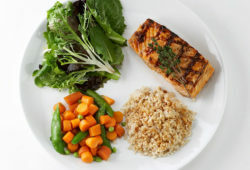 Eating healthy (a subject of controversy by itself) has to be important to overall health. But the issue of eating, normally centered on eating healthy, now has shifted to when we eat and, perhaps more importantly for this study, when we don’t eat. As physicians we are asked to evaluate data and then advise our patients accordingly. It would be easy to point out the flaws in this type of study and laugh it off. I don’t want to do that as medicine, science, research, and knowledge sometimes move forward in small baby steps. There is value in a study such as this if it is seen in a larger, more evolved context. To my patients with early stage breast cancer who are looking to get a leg up on their disease,…hell, live it up. 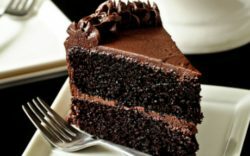 As an early stage patient you are in a great spot, Eating chocolate cake at midnight may be more satisfying that fretting over a small marginal increase in survival for you and your cohort of early stage breast cancer patients, most of whom I suspect love chocolate cake whatever the time of day or night.